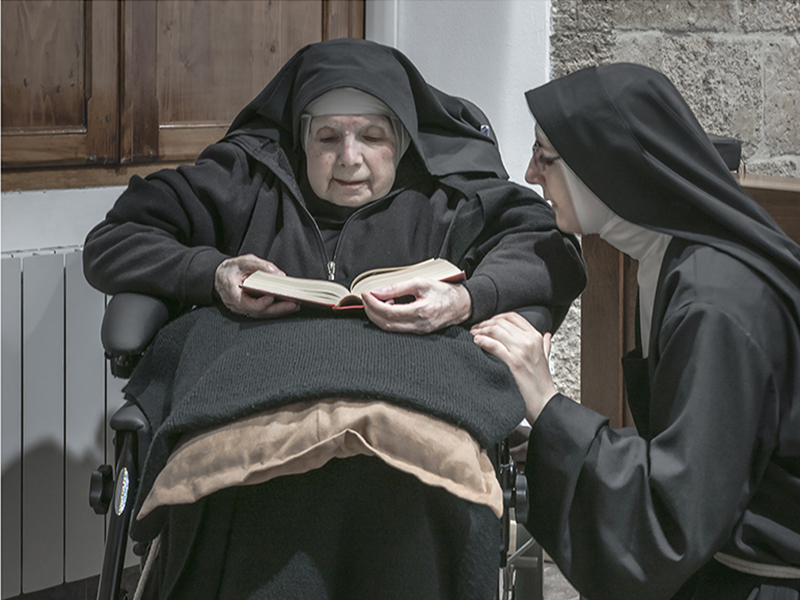 Sister Maria Giuseppina (left) and Sister Maria Caterina (right) are among 10 remaining nuns in a convent on the island of Sardinia who are breaking their silence and embracing the internet in an effort to ensure their order’s survival. This photo is from an exhibition being held at the Santa Chiara convent in Sardinia. Photo courtesy of Gabriele Calvisi. For centuries they lived in isolation and silence. They spent their lives as nuns in silent prayer, cut off from the world at a convent inspired by St. Clare on the island of Sardinia. Now the 10 remaining nuns who live behind the high walls of the convent in Oristano are breaking their silence and turning their back on tradition. With their own website, Facebook page and even a cellphone, the nuns are embracing the internet and social media and raising their profile as part of an effort to ensure the order’s survival. At a time when vocations to Catholic religious orders are falling, the nuns see their new approach as a means to promote their work and attract newcomers. If their numbers continue to fall they may be forced to leave their convent altogether. “There are many ways to use the internet to establish new relationships,” Caterina told RNS by telephone. The nuns, the oldest of whom is 95, take a vow of obedience, chastity and poverty when they join the order. They rise at 5:15 a.m. each day for prayers and daily Mass and pray eight times a day when they are not sewing, caring for children or tending the eggplants, tomatoes and other vegetables in their garden. They allow visitors inside for a few hours a day and continue to use the traditional “ruota,” a wheel connected to the door of the convent where the faithful leave prayer requests, food and donations for the nuns. In keeping with their new approach, the nuns have recently published a book about their lives and are holding a photo exhibition (until June 17) that gives the public a rare peek at their lives inside the convent. The photo exhibition has already attracted thousands of visitors. “The fact the we have chosen to live a cloistered life does not mean we can’t keep up with the times,” said Caterina. “We say it is not against our principles. On the contrary, the objective is to make ourselves known, to let people know where we are and how we live. The nuns have not abandoned their traditions completely. They still pray and meditate. But they also recognize the imperative for change.